5335 Damocles is an outer-system asteroid with a period(year) of about 40 years, 219 days, discovered on 18 February 1991 by Robert H. McNaught at the Anglo-Australian Observatory at Coonabarabran, New South Wales, Australia. 5335 Damocles was named for a courtier of the ancient tyrant Dionysus I(The Elder) of Syracuse who lived in the 4th century BCE. 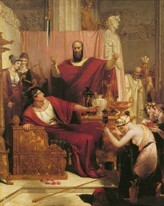 Damocles was a real person, though his story has become mythic: his constant flattery of his king and talk about how wonderful it must be to be a king wearied Dionysus, who decided to teach him a lesson by inviting him to a sumptuous banquet, after which Dionysus directed Damocles' attention upward, to where a big sharp sword was suspended directly over his head by a single hair--so as to illustrate the constant danger as well as the great privilege and pleasures of being a king. Since then the phrase "sword of Damocles" has come to mean an ever-present threat of disaster. "The Sword of Damocles", an 1812 oil painting by British painter Richard Westall(1765-1836). Damocles is the prototype of the damocloid asteroids, asteroids with highly eccentric orbits which cross the orbits of the gas giants, the main asteroid belt, and Mars. Click here for the discovery chart. "The time of the exposure was 1991 Feb 18.52973 UT to 18.57140 UT and the object was discovered on that plate perhaps 20 hours later when I scanned it. The scope was the 1.2-m U.K. Schmidt Telescope of the Anglo-Australian Observatory (situated at Siding Spring in NSW[New South Wales]. Note that Siding Spring Observatory on the same mountain is a different institution.) The scope is basically the same as the big Palomar Schmidt. We do not take photos ourselves, but scan the plates taken for other purposes, mostly the southern sky survey. Since 1990, we have found about 8 NEA's each year. 1991 DA is not an NEA but was certainly a most interesting discovery. Confirmation was by myself using the 0.5-m Uppsala Southern Schmidt on 1991 Feb. 19.67361 UT." 1991 DA was later named Damocles. In this case, the discovery occurred approximately 20 hours after the photographic plate was exposed. It has been proposed that perhaps it is the nucleus of a dead comet, as its orbit is extremely eccentric. On the scale astronomers use to express the shape of the orbit of a heavenly body in which 0.0 is a perfect circle and 1.0 a straight line, with the values in between an ellipse growing flatter as the numbers go up, Damocles' orbit is 0.8669, not quite straight back and forth from the Sun but fairly close to it. At perihelion, its closest approach to the Sun, it crosses the orbit of Mars, coming only 1.6 astronomical units(AU) away from its parent star(1 AU=93 million miles,the approximate distance from the Sun to Earth). At aphelion, its farthest distance from the Sun, it is 22 AU away, going beyond Uranus' orbit. Its orbit is steeply tilted to the plane of the ecliptic(the sun's equator projected into space, which the planets and asteroids' orbits more or less follow).Its latitude(position relative to the ecliptic)can go as high as 84 degrees, a right angle to the ecliptic being 90 degrees. The extreme eccentricity of Damocles' orbit makes its transits strange; it spends most of its cycle of 41 years in one sign, Aquarius, racing through the signs from Aries to Sagittarius in just 2 1/2 years(from April 1989 to October 1991), spending only about 4 years in Pisces(1985-1989) and only about 2 years in Capricorn(off and on in 1991 to 1994). Therefore, most of the population, those born in the remaining 32 1/2 years, have Damocles in Aquarius. Zane Stein speculates that the influence of Aquarius might actually be, at least in part, the influence of Damocles. I would say that insofar as Aquarius is a sign of politics, ideology or groupthink and impels toward change and toward nonconformity and the sanctioning of it and the stress that comes with change and the pressure which nonconformity inspires in a regimented or semiregimented population, the influence of Damocles and of Aquarius coincide, and we may associate Damocles with Aquarius or with Letter Eleven of the astrological alphabet. The location of the North Node of Damocles, 14 Aquarius 08, reinforces the connection with Aquarius and with Letter Eleven. The Sabian symbol for 14 Aquarius, "Two lovebirds sitting on a fence," stands for self-consistency winning absolute loyalty and complete cooperation on one hand, and unreasoning jealousy on the other. This suggests that the self-assurance that Damocles indicates, which Damoclean crises demand, may in itself provoke or exacerbate antagonism. I suspect that Damocles in Pisces indicates that image and/or surrender to the group or something larger or higher than the individual will figure prominently in the native's life. Many individuals who have achieved prominence in the fields of sports and entertainment have this placement. The political figures and social activists with this placement, such as President and Mrs. Clinton, Simon Weisenthal, Albert Speer, Emperor Hirohito of Japan, Henry Cabot Lodge, Dan Quayle, and Czarevitch Alexis of Russia--tend to be independently wealthy or have dharma that has heavy moral connotations or both. Any negative moral connotations tend toward debatability in some way. Damocles in Capricorn seems to resonate even more strongly, both morally and politically. E.g.,Ronald Reagan, Richard Nixon, Aly Khan, Roy Rogers, Pope John Paul I, Jackie Coogan. Most of the population has Damocles in Capricorn, Aquarius, and Pisces. Damocles' influence arises from the archetype of its namesake. First of all, it indicates a high level of stress. This may arise from ordinary life circumstances creating a feeling of impending or ever-present potential for disaster. Or this stress may arise from extraordinary circumstances such as deprivation, extraordinary danger, transitions, persecution or a high degree of peer pressure or trials arising from the possession of power,privilege, high station, wealth, natural physical gifts, or talents, or some form of nonconformity, of challenging a tenet or shibboleth or deviating from a norm. Damocles also indicates transitions, changes of direction, the destruction of the old to make way for the new, the removal of one arrangement of scenery in one's life to make way for a new arrangement, the replacement of an old paradigm with a new one. E.g. During one period in which Damocles was swift of motion, just after World War II, the Cold War began, and war took on a whole new meaning and a whole new potential: we now had the ability to annihilate most, if not all, life on the planet; we could not win a nuclear war, as there would be nothing but radioactive deserts to win and nobody to win it. The Cold War ended during the next period in which Damocles was swift of motion, in the late 1980s and early 1990s; the collapse of the Soviet Union took place as Damocles transited across its natal Sun in Scorpio, and suddenly a bilateral struggle for dominance in world politics was replaced by a multilateral struggle, in which many nations compete for influence. Damocles may indicate awareness of change taking place, or having taken place, more than the change itself. David Helfgott, the Australian concert pianist whose abuse by his father precipitated a drastic psychological change resulting in a fragile, highly eccentric personality--many would say chronic mental illness, or something more colloquial--has Damocles in Pisces conjunct his MC on the 9th house side, sextile his Sun and trine his Jupiter. He is as well known or better known for his eccentricity and problems as he is for his piano-playing. Damocles can signify:threats, retribution(deferred or immediate), feuds, precarious situations, downfalls, illusions of fame, fortune and power, predators, stalking, the act of besiegement, implosion, disintegration, termination, revolution, nuclear arms, brinkmanship, bluster, flattery, pseudonyms, and false identities. Generally, Damocles simply indicates one's relationship with temporal power and authority, ability to handle stress and change and lessons about worldly ambition, political ability, beliefs, vision, eccentricities, personal negativity and capacity for heroism. Of all these only Damocles has been observed for a whole synodic cycle (2 oppositions), so all these orbits are more or less preliminary, and we must not forget that Damocles was lost in 1992, soon after its discovery, so the present ephemeris may show significant errors for positions before the 1980's. Consideration of this "family" is interesting to me for 2 reasons:it helps me understand the nature of the centaurs, as these are also crossers, more aggressive crossers indeed than centaurs, but they are linked to the innersolar system, like comets, while centaurs always remain within the sphere of the giant outer planets.The second reason why they are interesting to me, is because they make me wonder about comets, since the only difference I perceive between comets andthese bodies, is that comets come within the earth region and they don't. Of course, there is the obvious reasons of not having a "tail", and of comets being always smaller in size. Now: we never interpret comets in classical astrology, because we don't know how to. Many comets have parabolic orbits that come from the absolute unknown of the Oort region[on the fringe of the solar system, from which all comets come], and their apparition is quite unpredictable, therefore falling out of the astrological corpus, which is based on the concept of cyclic "return". But there are short period comets whose returns are predictable and well-known, like comet Halley, which never leaves the region of the main planets, "our region".The period of comet Halley, for example, is about 76 years, the same as Asbolus. When Halley reaches its aphelion around 19 Pisces, it is way "behind" Neptune, in the Neptune/Pluto region. But here is the difference, when Halley comes, it reaches the earth-realm, almost "touching" us with his coma. Asbolus will never do that, but it is easy to perceive how they are related: both are "cometary". In other words, what we are learning about centaurs, is teaching us about the astrological meaning of comets, and the age-old powerful symbolism and folklore about comets, helps us understand the nature of the centaurs.The problem, astrologically speaking, is one of methodology, of learning how to deal with all these bodies without falling into triviality and meaninglessness. This is a real challenge, but it is not unsurmountable. It simply means that the old paradigms of astrology are beginning to be substituted by new ones,as is happening in everything else in the world. No dogma will survive "the attack of the little ones", "the orbit crossers", in every facet of life, of human knowledge and of experience. They are destroying all the barriers. If we resist them, they will destroy us, too. --Costa Rican astrologer Juan Antonio Revilla, from a Centaur@onelist.com post in October 1999. I wrote this article for GAIA, the quarterly newsletter of AST SIG, the asteroid special interest group of the National Council for Geocosmic Research.